This book is not – and does not want to be – another antispeciesist manifesto, but, more modestly, a contribution for laying the foundations of a political thought able to listen to what the immense animal pain has to say. Facing the spreading popularity of a mediatized animalism in fact incapable of influencing the existing, this book argues a very clear thesis: our relationship with animals is an integral part of the ideology and practice of the domain. Today society uses non-human flesh as a material to build its hierarchical architectures. From this perspective, this book advocates the politicization of antispecism, which should on the one side hybridize itself with the theoretical acquisitions and political experiences of the liberation movements of the longest course and, on the other, gain enough credibility to expose the «anthropocentric unspoken» that still lurks in those acquisitions and experiences. The antispeciesist movement is therefore no longer called to prove the unquestionable, i.e. the suffering of animals, but to reflect on how to change the state of things. From here can take shape that political movement without which the liberation instances hitherto proclaimed would easily be reabsorbed into the system belly. 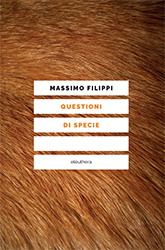 Massimo Filippi, professor of Neurology, is first and foremost another animal that has been taking care of antispeciesism from a philosophical and political point of view. Among his most recent publications: Altre specie di politica (Mimesis, 2016; in collaborazione con M. Hardt e M. Maurizi) and L'invenzione della specie. Sovvertire la norma, divenire mostri (ombre corte, 2016). Antispecismo/ Una questione di passione?